Vaar langs de Middellandse Zeekust van Turkije tijdens een boottocht van een hele dag naar de oude stad Phaselis, zwem in schilderachtige baaien en geniet van het uitzicht op het Taurus-gebergte vanaf het water. Je hebt tijd om het historische havenstadje te verkennen met een gids, of breng een luie ochtend door in de Turkse zon. 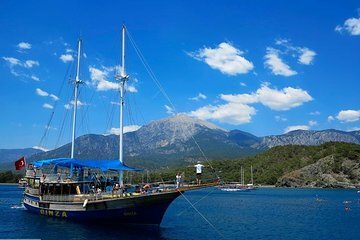 Deze daglange tour is inclusief ophalen en wegbrengen bij centraal gelegen hotels in Antalya, met live entertainment gedurende de hele reis en een verse lunch bereid op de boot. Ontmoet een chauffeur in je hotel in Antalya voor je ochtendvertrek en ga vervolgens naar de jachthaven van Kemer, waar je aan boord gaat van een rondvaartboot met twee dekboten. Zoek een comfortabele plek om te ontspannen aan dek terwijl de kapitein langs de kust stuurt, en houd je camera klaar voor opnamen van het Taurusgebergte met een voorgrond van kristalhelder water. Maak onderweg verschillende zwemstops en pauzeer in perfecte golven die perfect zijn om af te koelen. Bij aankomst in Phaselis heeft u de mogelijkheid om naar de kust te gaan en de stad te verkennen: volg de lange, oude weg door het centrum van de stad, bekijk de ruïnes van winkels en warenhuizen en bezoek de voormalige sites van Romeinse baden en openbare pleinen (boottransfer en toegang tot Phaselis zijn op eigen kosten). Terug op de boot, tanken voor een middagje cruisen met een lunch van gegrilde kip of vis aan de zijkanten, en begin de terugreis naar Kemer, kijkend naar dolfijnen in het kielzog van de boot. Deze Phaselis-boottocht van een hele dag wordt afgesloten met retourtransfer naar uw oorspronkelijke vertrekpunt. We booked this trip weeks in advance and received an email from the tour operator saying that our hotel was outside the normal collection area for the included hotel pick-up but that they would contact us to say if that was possible, indeed a few days later we received an email to say that we would be collected at no extra charge but a little earlier than the advertised time as it is 1.5 hours from Kemer Marina, on the designated day a smart, clean and comfortable mini bus arrived to take us to the Marina, the trip was long but interesting with some nice views along the way, on arrival at the Marina we were welcomed aboard the purpose built boat for our tour, casting off to the inspiring tune from PIrates of the Caribbean as with all these boat tours we travelled a short distance along beautiful coastline and anchored in a small bay for some sea swimming for those that wanted to, you can jump from the ships sides or step off the rear and on this boat you can even use the theme park style water chute to take you into the sea, then on to Phaselis ancient ruins where for a small extra fee you can be taken ashore in a small boat to tour the ruins, stay aboard or have another swim, then it is time for lunch, as with all the similar tours, lunch is simple but tasty and filling. then the cruise home, around 4 hours in total and made great fun by a fantastic, helpful and friendly crew, an added bonus is that this ship is fitted with a foam machine and we were treated to an on deck foam party during the voyage, now bear in mind I am 61 and though not my first foam party I really enjoyed getting down and wet : we loved this trip though we have done many similar around the Med and think it is great value for money and one of the better ships amongst the fleet at the Marina run by various tour companies, we also felt they were good with the pre-tour information and fairness in adapting to our pick-up needs, we rated them high compared with other tours we booked. Booked weeks in advance and first received a mail saying that our hotel was outside the normal collection area and we would be informed if the collection was viable, we did receive another mail promptly saying they would pick us up at no extra charge but at a slightly earlier time, good service which if you read our other reviews you will see is not always the case with other tour operators. The collection was punctual and in a smart, clean and comfortable Mini bus, it took around an hour and a half to get to Kemer but interesting sights on the journey. At the marina we were welcomed aboard and it was explained what to expect, we sailed off on a great looking pirate style ship to the rousing anthem of the the theme tune to Pirates of the Caribbean the tune all these boats seem to play from Crete to Turkey after a short cruise we anchored up for some sea swimming, the boat is equipped with a theme park style water slide which take you from the deck to the sea or you can step off the back of the ship or jump from the sides, then another cruise along the shoreline to Phaselis where for a small fee you can take an excursion to see the ancient ruins, back to the ship for Lunch and a nice long sun basking cruise back approx. 4 hours of fun on the way back we were treated to a foam party on the deck which was great fun, bearing in mind I am 61 but still like to rock a party We really enjoyed this tour, the staff are great, fantastic in fact and it was fun all the way and more importantly good value for money, lunch like all these trips was simple but filling and nice. This was by far the worst trip I think I have ever been on in my life. If you are an English speaker DO NOT GO ON THIS hardly anyone spoke any so there was no one to be complaining to! The day of our trip was changed without allowing us to opt for the day we had actually booked. 3 hours in a cramped minibus to get to the marina which was in Kemer NOT Antalya, we were issued by people with SO little English onto a joke of a themed boat utter trashy which had glass tiles not totally secured to the tables-health and safety would have it shut down so quickly. The 'music' for want of a better word was loud and thumping most of the trip, there was nowhere to escape the 'noise'. We had NO opportunity to go to Phaselis, which was the whole purpose of buying this in the first place. Added extras seemed to crop in at every opportunity from someone stating it was part of lunch but actually selling bread type products, to drinks even water being extortionate prices, ice-cream, photos...WHAT A RIP OFF!!! The best part of it was being able to be in the water OFF the boat! I took a snorkel set, but where we stopped was rubbish for that too. To top all of the horrendous journey off, they started a foam 'dance'...it was RIDICULOUS and I have video proof of the utter stupidity of it all...hairy back, bad 'dad' dancing, rude and ignorant Russians wiping foam over themselves and watching 2 girls, having been paid to podium dance! PLEASE FOR THE LOVE OF YOUR SANITY AND SO YOU CAN HAVE AN ENJOYABLE HOLIDAY, DO NOT WASTE YOUR MONEY ON THIS TRIP. 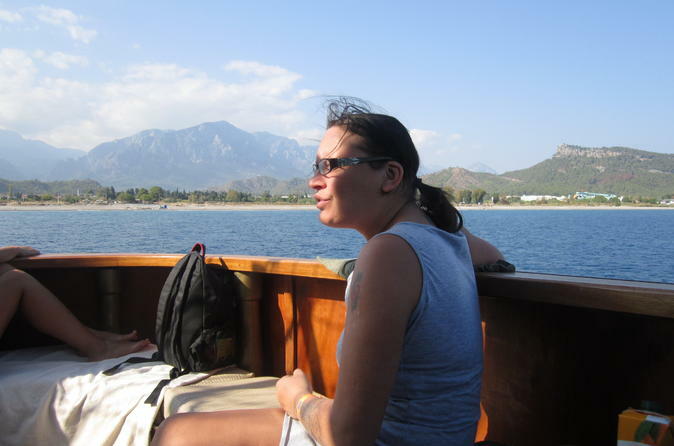 In saying that, we did go to Antalya harbour on the day we were supposed to have the trip and the boats there seemed a lot nicer and I didn't see a foam machine on any of them...maybe we just missed the trashy ones that morning. It really isn't worth chancing it though...DON'T GO!!! This trip is nice, the boat is really large and beautiful. The staff is funny so we really enjoy.